Whether the USA, UK, Australia or any other county located at this globe, it happens everywhere that students or freshers who have recently got a job come across with many situations where their limited knowledge and understanding is held inadequate. At the initial stages of your career, you are given plenty of projects that you may not handle all alone. You require a professional job support from India then that will not only help you complete your project or task, but also provide you effective on-job training to solve such cases in the future. It's quite easy to approach us with your technical IT problems and we'll provide you with instant solutions for them. You can submit your request through the contact us form on our site. Once we receive your request, we will contact you in less than 12 hours. In case you need urgent assistance, you can directly call us on +91 9980551764. We are available 24/7 on call. Here at Yexaa.com, we have a team of professional and experienced IT experts who possess more than 5 years of experience in developing websites and mobile applications. Expanding the range of our IT services, we also offer on-job support and IT training to both students and professionals. We provide job support from India to the fresh candidates who face difficulties in understanding technical things, and who aren’t able to handle technical projects. 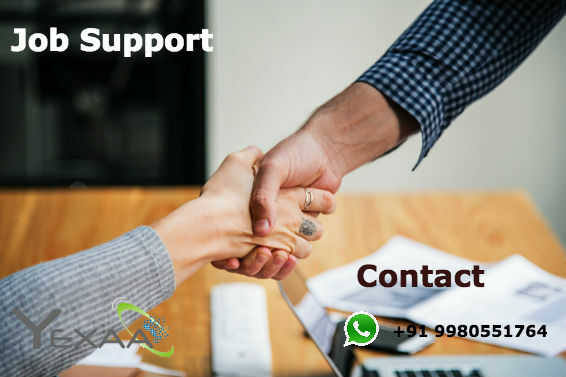 Based in India, we provide proxy job support from India in the USA, UK, Canada, Australia, and other countries at quite affordable prices. We offer our job support from India services to students, freshers, and professionals as well. If you have just passed your university and have recently found a job, you can contact us to get instant solutions for different technical things you aren’t aware of. In case you are a professional, we also have plenty of meaningful opportunities for you that will transform you into a master. To provide high quality service at affordable rates is the base of our work criterion. Once we have got your request, we’ll first see your project and the technologies you are using. If you we find our team 100% sure to support you, we will take no time then in providing you our job assistance service. 100% refund will be provided for unused hours if you are not satisfied with Quality of support engineer or if we are not able to support the technology in use. We have over 5 yeras of experience in job support. Planning to opt job support from us? We are team of highly qualified and experienced Job Support experts are confident enough and ready to take any challenges and able to fix or resolve any issues which you are facing in your project. If you are facing any issue in completing your task assigned to you, we could make an agreement (simple and transparent) of certain amount for Job Support that you will be billed for a defined amount of task. I was assigned in ReactJs project which is new to me. I searched so far many consultancy at last I found Yexaa for Job Support from India. Java trainers were good and well qualified. Excellent training and Job Support from India. Value for money i spent. Overall very good experience with mind Yexaa. Yexaa is best consultancy for Job Support from India. Srikanth was my developer and he is highly experienced and talented developer in AngularJS. Thanks Yexaa and team. Balaji was able to resolve our queries and question effectively. I really liked the the way he fixed my issues and explained me well. Yexaa is best for Job Support from India. It has been an excellent experience with Yexaa for Job Support from India. The team those Subhash and developer is active in communication and provides best support. Thanks Yexaa! !